As will be discussed in an upcoming podcast, there's something so great about snacks in plastic tubs. I love the act of opening them - especially removing that shrinkwrapped plastic ring that holds the lid on. I have no idea why that is, but in some ways, I guess it feels like opening a present, except since it's a clear plastic tub, you already know it's going to be good (or so you hope). I like the little plasticky sounds and all. Okay, I'm weird. Also speaking of podcasts and having no idea...my laptop sat around untouched all day long. Why it decided to automatically and without warning launch into some hours-long Windows 10-related update literally 30 seconds before Nathan, Sonia, Grand Master Marvo, and I were going to record last night is beyond me. I mean, it was doing nothing all day - why then? Sorry about that, we should have our next episode of Let's Talk TJ's later on next week now because of those shenanigans. 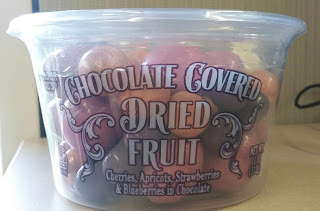 But back to the matter at hand - this time around, Trader Joe's Chocolate Covered Dried Fruit. C'mon, this looks like fun - there's the different sized food marbles, in different colors, with different fruits. 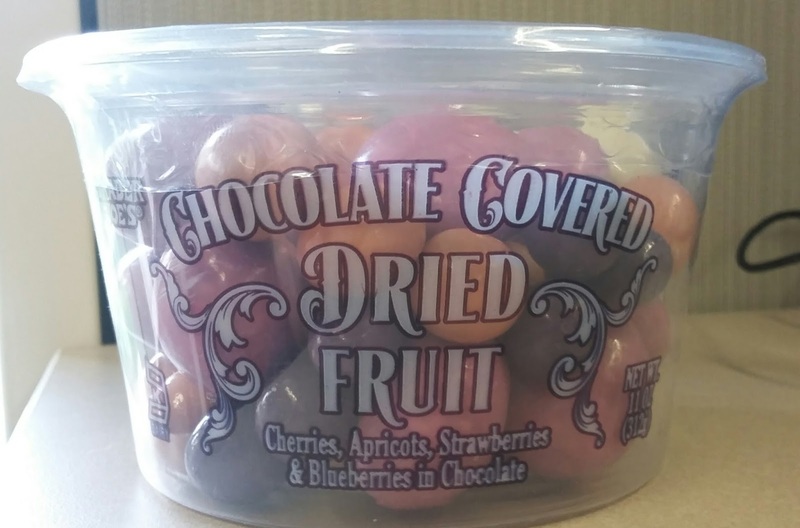 Opening up the package not only had all the usual tub-popping satisfaction, but also made a huge waft of chocolate came up and smack me in the nostrils. This was going to be fun. 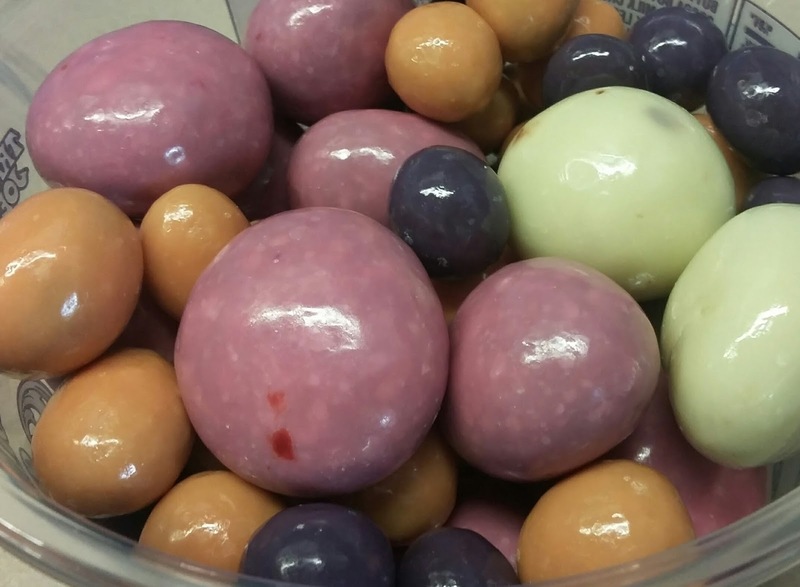 In case you're like me and want to know which colors are which right away, the pinkish ones are the cherries, whitish are strawberries, grayish/purplish are blueberries, and the orangish/tannish are the apricots. There's an -ish for each color, because much to TJ's props, these candies are naturally colored with things like beet juice. Much better than artificial colors, if you ask me, even if the tradeoff is less vibrant coloration. It's not like they affect the flavor anyways. What does alter the flavor, though, is the composition of those coatings. 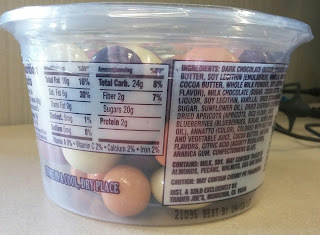 I expected the usual M&M-y candy shellac, straight into chocolate with a fruit coat. That's not quite right. Instead there's about a few hairs-thick coat of softer white chocolate, before hitting into the dark chocolate. It's kinda offputting. At first I thought maybe it was one of those yogurt-kinda layers, because as compared to the dark chocolate, that's almost what it tastes like - kinda two ends of the spectrum being put right together. Other than that, the experience is what's to be expected. the cherries and strawberries pop out more in their respective flavors, the blueberries are representative enough, but the apricots? Good idea, I like the theory, but I wouldn't have guessed apricot if I weren't told that's what in there. Instead, it just feels like a dried, chewy, semi-chalky center that gets overpowered by the chocolate. All the other fruits taste they way they ought, with that similar kinda feel. 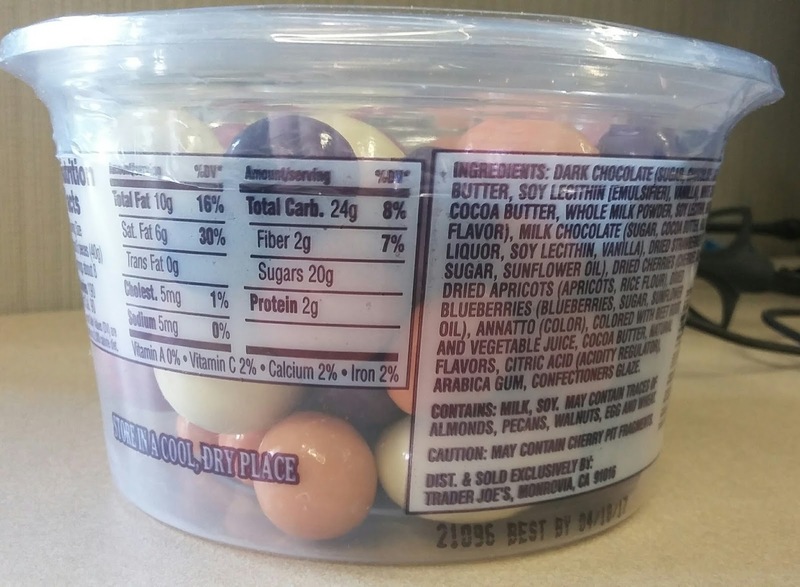 Anyways, I will say these choco-fruity tidbits definitely hit more of a chocolate spot than a fruit one if you're looking for that brand of sweetness. There's nothing terribly wondrous about them, nothing overly bad either - just curious with that white chocolate layer if you ask me. I snuck 'em into work without Sandy having a chance to try them, so I shared them with a co-worker or two, and got a mostly satisfied "meh" in return. They're deserving of slightly better and to me rank as a fairly solid "not bad."